The most difficult part of writing your first blog post is overcoming that fear of putting yourself out there in a new and different way. So even as you read through the below suggestions, remember that it doesn’t really matter what you write in your first post, it matters that you write it. Blogging does indeed make you vulnerable. Your ideas are out in the world in a way that they weren’t previously. But if you can feel the fear and do it anyway, you’ll be able to help so many people and get all the business and marketing benefits that blogging has too. Introduce yourself – at the beginning of the post, you’ll introduce yourself to your blog readers. Make is casual and friendly including some fun information about yourself as well as a photo. Tell us your why – share why you are passionate about the idea of having a blog and why your mission is important to you? This could be framed as a series of “I believe…” statements or just a flow of consciousness around why you care. Invite readers and collaborators in – are you going to have guest posts? How do you want readers reaching out to you? The intro post is a good place to share what opportunities people will have to interact and engage in your blog. Saying hi and welcome and giving information in an introductory style might not fit your personality. Instead, you can of course jump right into a “normal” blog post from the start. There’s really no reason not to hit the ground running or as I am calling it, start the party from the first day. In order to start the party, you’ll want to have some solid ideas around what topics you’ll be blogging about. You could also use our free blog post idea generator to get some ideas. What questions do my best fit clients have on their minds when they sit down with me for their first session? If I saw someone at a party and told them that I’m a therapist, what questions would they want to ask me about therapy? What keeps people from getting therapy services? Is there content that I can create that will help them through? This is a more advanced first blog post idea not for the faint of heart. One great thing about blogging is the possibility of collaborating on content creation with others. So why not get started from day one? I heard about your awesome services from my sister Liz and am reaching out to you because of your amazing website and the rave reviews. I’m a therapist in private practice helping women become more body positive here in Austin. Do you think you could share 200 words on this? If so, that would be amazing. I’ll feature you in the post and link back to your site. 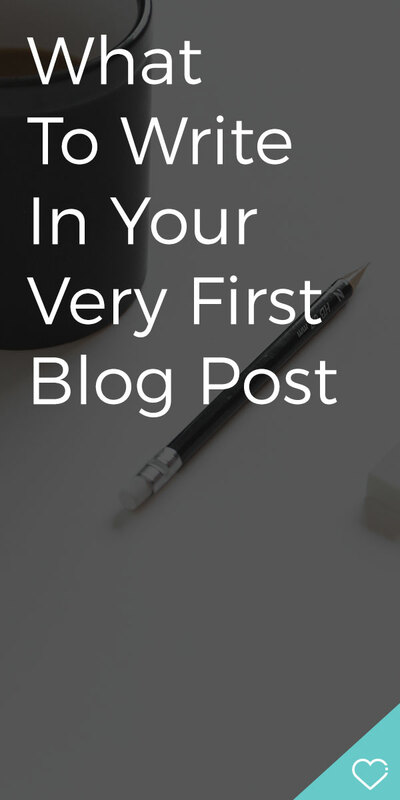 If one of the three first blog post concepts spoke to you, I hope you’re not reading this and already have a document out for outlining your first ever blog post. Most of your blog post readers are completely self interested. They visit your blog to know more about how you can help them in their life transformation from suffering to healing. So if you are able to overcome the fear of “what if I post this and everyone thinks I’m stupid?”, then you’ll have opened to the possibility of helping more people heal. Now get out there and blog. And let me know how it goes. Would love to read your first blog post and give you feedback.